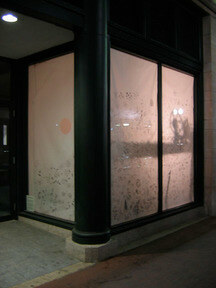 providence art windows project • site-specific installations illuminating the urban landscape in storefront windows. based on poetry by diana di prima, this narative shadowbox was a collaborative site-specific work constructed by c h r i s t i n e s e r c h i a & j e r e m y r a d t k e.
An enclosed diorama veiled in translucent botanical wallpaper with light graphite renderings of floral and vegetational drawings. 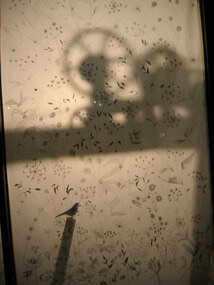 The interior housed small birds shown only through the silhouetted projections of their shape. Using small motors or mobile found objects the tiny suspended birds observe a kinetic migratory pattern visible from the exterior of the window pane as they are backlit . After inspiration was derived from 'The Window', a Diane di Prima poem painting birds in backwards flight, the installation resulted in a dichotomy transforming outside to inside. As a window box, a shadow box of natural phenomena, the site-specific installation vignettes a quiet narrative, and reveals through subtle peepholes in the vellum one particular revealing scene of the truth to the shadows, and offers a glimpse of a bird in it's natural [though unnatural] habitat. 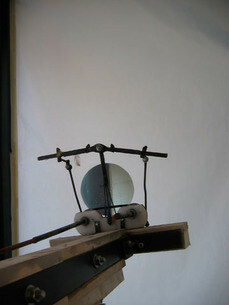 Subtle audio is found via the found objects serving as motors, such as record players, which though hidden, offer the element of sound and motion. 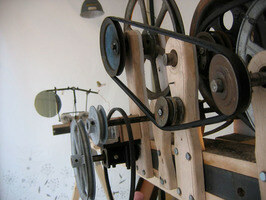 The birds continue their vicarious migratory cycle observed in spinning motors: the landscape of the once vacant window. 'The Window' is an animation of silhouette, and a silhouette of dualistic poetry. the providence art windows project is a continuing collection ofpublic installations permeating through an entire city. artists areselected to contribute works and site-specific installation to illuminate a new england cityscape. storefront windows in downtown providence, rhode island will offer artistic constellations and visual influence ineveryday places as dictated from the artists that reside there. the next edition will commence as the december edition of gallery night. w h e n: december 8, 2007from 6 o'clock to the nines and continue exhibition until march 2008.